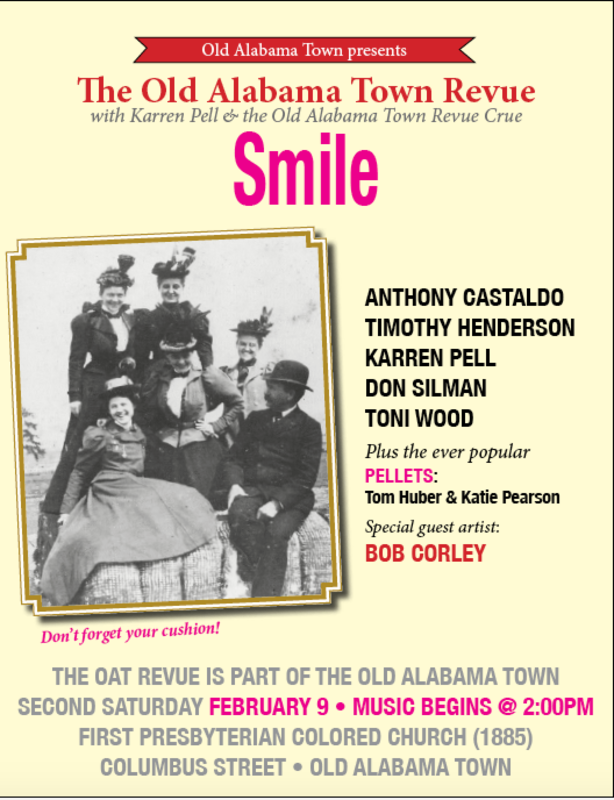 The Old Alabama Town Revue presents its February show, “Smile.” The show is dedicated to our friend and supporter, Len Daley, whom we lost in an automobile accident right before Christmas. Len was a part of the Christmas show, and his last words to us all were to smile. So this show, since it is also in February, features fun songs about love and friendship. Come prepared to have a good time. We have old faves and original songs. Tim has worked up a Fats Waller song sure to get more than one chuckle. Toni is going classic with “Smile.” I’ll render an original called, “I’m a Lucky Dog,” which I certainly hope gets a howl or two! Singer-songwriter Bob Corley will also be joining us. Tony Castaldo will keep the beat strong and Don Silman with keep the bottom end steady. The Pellets will fill out the middle! February is also Black History Month and provides a good time to appreciate the wonderful venue that hosts the Old Alabama Town Revue: First Presbyterian Colored Church (1885). In the words of another friend we lost in 2018, Mary Ann Neeley, “The one story frame building with long windows, cornice molding and a small steeple. . . served its congregation on the corner of Stone Street and Cleveland Avenue until the Interstate plowed through Montgomery in the 1960s.” The history of the Presbyterian community begins with the early days of Montgomery in 1824. During those times, black and white members worshiped in the same building, but the black congregation sat in a gallery. In the early 1880s, the African-American members wanted their own congregation and built this church. Although judged a simple structure, Mary Ann writes of “notable architectural features including long windows shielded by louvered shutters and handsome cornice moldings.” Notice these when you come to the show! For several years the white Presbyterian Church remained involved with the black congregation, even hiring its black ministers. However, in 1888, the African-American church community asked to be separated, and the white Montgomery Presbyterian Session voted to ‘dismiss from this church the colored members that they might organize a church of their own officers and under the name of the First Presbyterian Colored Church of Montgomery.’ Mary Ann explains the next development: In 1966, the black Central Alabama Presbytery dissolved, and the East Alabama Presbytery received the Cleveland Avenue Presbyterian Church under its jurisdiction.” When the construction of I-85 destroyed the church’s site, the church committee approved the acquisition of a new church at the corner of Goode and Wade Streets. The community renamed their congregation the “Calvary Presbyterian Church.” Landmarks Foundation then stepped in and saved the old church building. With the help of the Black Culture Preservation Committee, under the guidance of Dr. Zelia Evans, the church was moved to Old Alabama Town. There was one other change. When the church became a part of Old Alabama Town, it had modern pews. Since the church was featured for its historical importance, these modern pews were replaced by older pews from a “small country congregation in a neighboring county.” So we can attribute the comfort level of the current pews to historical accuracy! The Landmarks Foundation dedicated the First Presbyterian Colored Church on December 4, 1977. This rendition of The Old Alabama Town Revue will be part of the new “Second Saturdays” at Old Alabama Town. Starting in January, the museum’s weekend availability is only the second Saturday of the month. However, that day’s entrance is free to the public. So come visit the wonderful buildings and take in the Old Alabama Town Revue at 2 p.m. in the First Presbyterian Colored Church on Columbus Street. So come be a part of our celebration of life, friendship, and love. Come and be prepared to smile — even laugh! And don’t forget your cushion. Karren Pell is a writer, teacher, and performer who lives with her husband, Tim Henderson, and an assortment of cats and dogs in Capitol Heights. She is the author of three books. Her musical compositions range from commercial songs to theatrical works, with five musical adaptations to her credit.